The foundation year’s education is the singularly most important part of learning in the life of a person. Both, the parents first and then the school are responsible to lay all-encompassing foundation in any child. How much successful an individual is, undoubtedly, depends upon positive and constructive academic nurturing, along with conducive social, emotional and spiritual interactions that the person endured during the journey from childhood to adulthood.The most crucial ‘test’ that beholds a child’s successful upbringing is the ability as an adult to resolve real life problems and conflicts. (a) The first stage of formal learning for a child is up to the age 3. This stage is also known as the pre-school stage where a child learns to recognize the environment through an unstructured curriculum. The child should only be made to learn the most basic skills comprising sitting, walking, recognition, audio and visual perceptions, etc. There should not be any type of controlled activity, such as writing, which may involve use of underdeveloped fine motor skills. (b) The next stage is beyond age 3 where a child enters formal schooling. Children are steadily exposed to a schedule. In this stage, the readiness of a child to write is judged by the child’s capability to handle an age-suitable writing tool such as the crayon. Before starting to write, it is imperative that children have well-developed muscular control to form letters and arithmetic numbers. Hence, at this stage, children should not be exposed to formal writing. Some of the suggested activities for this age (3+) group are cutting paper with scissors, coloring with a crayon, tearing and pasting, etc as these activities develop the fine motor skills and the child is ready to hold a pencil and write effortlessly in the next class. Similarly, from having a vocabulary of around 500 words at age 3, it should go up to 1000 words (approximately) by the time the child is 4. Suggested activities to enhance language skills for this age (3+) group are normal conversation, rhymes, stories, etc. 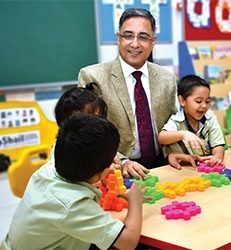 The aforesaid pedagogy for children of Nursery (age group 3+) is one of the most scientific ways of imparting‘right skills at right age’. These techniques have been evolved over a period of time with due research and are also child-centric. An advice to parents- avoid pushing your children into learning those skills, which they are not age-ready to do, particularly, during the foundation years of their children.